It's not just fighting that can tear a relationship apart — lack of sleep can also contribute to the death of a marriage. 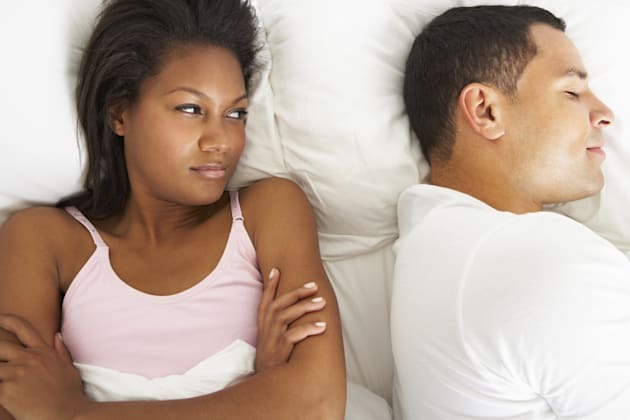 A new study in the journal Psychoneuroendocrinology says that not getting enough zzz's can raise inflammation levels, and this, when paired with spousal fights, can lead to marital stress and a decline in health. Scientists at Ohio State University went into their research knowing that people who have sleep disorders are at risk for diabetes, cancer, and heart disease, because of higher levels of inflammation in their bodies, so they sought to find out whether a night or two of sleep deprivation would raise inflammation in people who don't have serious sleep disorders. "We were interested to see how sleep related to inflammation among married couples, and whether one partner's sleep affected the other's inflammation," said Stephanie Wilson, lead researcher on the study. Researchers looked at 43 couples over two study visits. At each visit, the couples gave blood samples and reported how many hours they had slept the previous two nights. Researchers also gave the couples a topic they had to resolve which would create conflict between them. After discussing the topic, couples gave another blood sample to the researchers. According to the study results, if both partners got less than seven hours of sleep the previous two nights, the couple were more likely to "argue or become hostile." And couples who used "unhealthy tactics" in their discussion had an increase in inflammation of 10 per cent with each hour of less sleep. "What's concerning is both a lack of sleep and marital conflict are common in daily life. About half of our study couples had slept less than the recommended seven hours in recent nights," Wilson said. If these problems persist over time, you can get this nasty reverberation within the couple. And if the couple has children, there's potential for sleep interruption from the moment a baby is born and for several years afterwards. The National Sleep Foundation recommends adults between the ages of 26-64 get seven to nine hours of sleep a night, however, according to a study published in 2016, Canada is the third most sleep-deprived country and the Canadian Men's Health Foundation found that 33 per cent of men aged 30-49 were only getting four to six hours of sleep a night. "We would tell people that it's important to find good ways to process the relationship and resolve conflict — and get some good sleep," Kiecolt-Glaser said. So, if you do find yourself tired from lack of sleep, there are ways to get back on track, and make your marriage stronger than ever.